High Tech Marine operates with the most updated tools, such as the five axis CAD CAM system for the manufacture of models and moulds, the infusion Vacuum system for the manufacture of objects with composites such as kevlar, carbon fiber, combined to multiaxial glass fabrics “E” and vinylester resins; upon request HTM can build tenders in Full Carbon Manufacture thanks to a preimpregnation technology completed by an oven curing passage for the perfect unit catalysis. 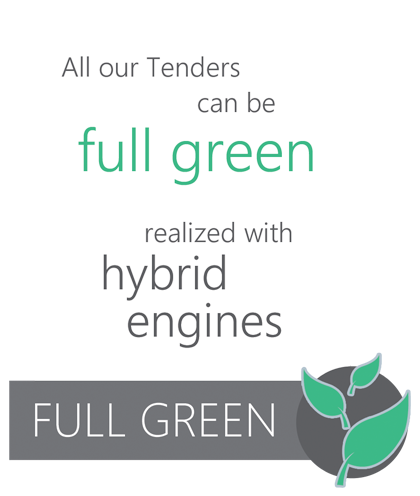 From an eco-sustainability point of view, High Tech Marine have today added Custom e Luxury Tenders to its range. Both tender types can be possibly realized either in alluminium, titanium. While the former material is already well known and widely used in the nautical field, the latter has never been applied being it difficult to process, though offering incontrovertible qualities for the sea environment safeguard. Aluminium, used as raw material for the tender manufacture, is for sure the most suitable one in case of one unit production slot, since, contrary to what composites need, it does not require any pre-mould or mould building: should a second unit be forseen, it would not be worth while adopting this production process, as alluminium requests very expensive epossidic stucco work and consequent varnishing. Titanium, used as raw material for the tender manufacture, is very prestigious and enables to create a unique piece, almost an artwork. The best realization of a tender made of titanium is represented by its satin finishing, without the application of any type of varnish, but shining in its natural allure. Wood, to create a completely handmade, fine and prestigious piece for vintage style lovers.